Every team played a total of 5 regular season games at the 2014 BSC with the exception of DCZ Finest who played a total of 6 games. The 6 teams with the best records advanced to the playoffs. 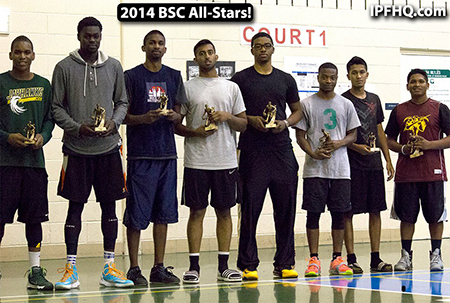 The 2014 BSC Champions: DCZ FINEST! 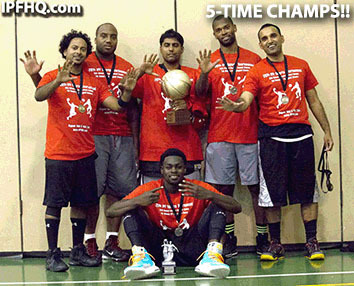 Full BSC Tournament Recap - Congrats to DCZ FINEST who win their BSC Record 5th Championship! The 12th Annual Blessan Samuel Classic is in the books! 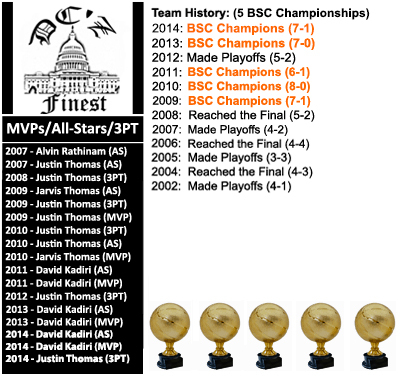 Congrats to DCZ Finest on winning a BSC record 5 championships. GAME OF THE YEAR: Gburg vs DC. Let's face it, DC has owned this matchup with Gburg lodging only 1 victory in the entire history of the series. All that changed on Friday night. In an overtime thriller, Gburg showed that they were no longer the "secondary" team. Look for this footage in 2015. Shout outs: I want to take this time to shout out the following people. Without their help, this event could not have happened. Justin George, Jenet Poopalan, Alvin Abraham, Crystal George, Charles Thomas, Calvin Thomas, Melvin George, Joshua Thomas, Godwin Gabriel, Fred Moses. To anyone I missed, many thanks for your support. Special thanks to all of the team captains of the BSC. Each captain was given an award in appreciation of the effort they put in every year! 1 DC: Five time champs. 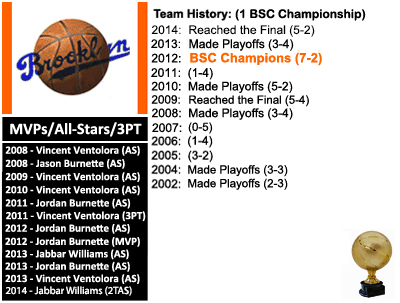 There’s not much to say about this team other than they are the most dominant team in BSC history. Not having much of a bench the second day may have played a role in their fatigue but they had an unstoppable weapon in David Kadiri. Find a way to stop Big Baby, then you have your answer in stopping them from getting their sixth next year. Oh by the way, he had the highest scoring output in the tourney this year (13ppg). No big deal. 2 Brooklyn: This team definitely improved from last year especially with the solid play of their core 3 starters. Their inside game improved in defense and rebounding. Jabar stepped up in the finals and single-handedly carried Brooklyn, giving them a chance to win the game. If they can learn to gel together as a team, they are right there to win the chip again! 3 Gburg: Wow. Just to give some comparison from last year, they were in sixth place going into the playoffs. 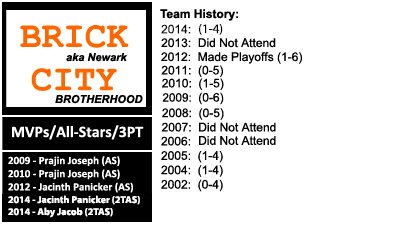 Adding Jonathan Fenwick to the squad really changed the way they played and Teddy’s play also improved with him on the court earning him a first team all-star spot. They gave DC their first regular season loss in a while and entertained the spectators with a historical triple overtime win against Philly. Gburg always manages to surprise teams so don’t count them out next year. It's worth mentioning that Gburg had not won a playoff game in its history...till 2014. 4 Toronto: Led by their all-star, Drew, and leading rebounder of the tourney (6 rpg), Shane, this team had another solid year. The addition of the Montreal guys really helped them as well, but they have to find a way to get out of the semis to truly be contenders. After tasting the finals in 2012, they have not been able to make it to the finals since then. If they can add a few more solid pieces and get it together, there is no reason why they cannot make finals every year and eventually win this tournament. 5 Philly: From making finals next year to coming into the playoffs with a losing record this year, there was a notable difference in how they played. Their teamwork and ball IQ remained consistent, but maybe it’s those years of wear and tear that are finally catching up to them. 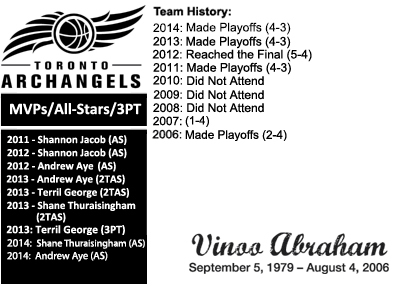 Vinil & Ricky stepped up this year which helped them make the second team all-star team. Their days are fast approaching, but they are still in that group of teams that still win it. 6 Strong Island: In their second year, the Stunnaz continue to turn heads and get people talking. Benson’s leadership and play on the court really facilitated in this team’s progression as a strong squad. The loss of Abel and other key contributors hurt them immensely especially going into the playoffs. Overall, they have gotten better but still need to develop those other areas to make some noise. 7 Lanham: One word: awesome. 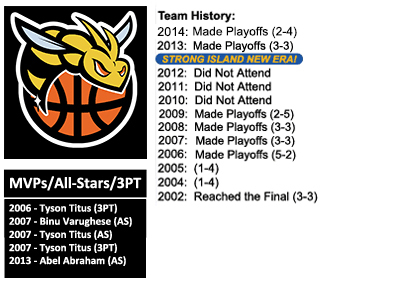 This team gradually increases their level of play every year. From not winning any games in 2012, to winning their first in 2013, to winning two games in 2014. If the trend continues, they can be a positive team in 2015! Calvin Thomas, everyone. Remember that name. The kid that practiced in his driveway every day hoping to become a great player achieved his dream by getting first team all-star. 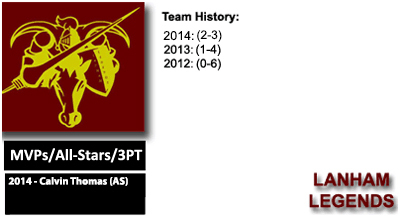 He had the second highest scoring output (11.2 ppg) after none other than Kadiri. Yeah, take a moment to let that sink in. Truly, one the greatest stories in this tournament’s history. Just goes to show you how the level of competition is improving even with younger and younger players. 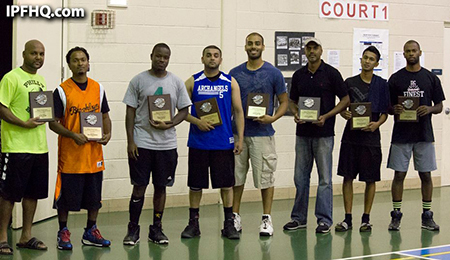 8 Brick City: After a one-year absence, this six-man team gave every team a run for their money and a win over Yonkers The one-two punch of Jacinth and Aby led the team and game those two well-deserving second team all-star spots. They need to add more to their bench so their starters can get some rest time. Either way, good job, fellas! 9 Yonkers: After a two year absence, Yonkers returned led by team captains James & Justin George. 2014 was a tough year for them however their team had a lot of young players. Look for improvement in 2015 as the new players have become acclimated to what the BSC is all about. 2015 BSC First Look: DC is the team to beat, everyone knows that. Having said that, Gburg, Toronto & Brooklyn pushed them to the brink. Will one of those teams claim the prize in 2015. Will another team emerge? Texas? Chicago? Look forward to seeing you next year!